Searching for Professionally Written Articles about Multiple Chemical Sensitivity, or MCS? Eureka, you've found them. I'm Dina, and I've been writing web content since 2003 and corporate advertising materials since 1996. These days, I manage my own private label rights content website and enjoy every minute of it. I get to write about all the biggest trending topics on the web. I get to make my own hours doing what I love. And best of all, I get to offer economically priced, superbly written articles that online business owners can use to make money with via their blogs. "Living and Coping With MCS" - PLR Articles for Download, perfect Niche Starter Pack! 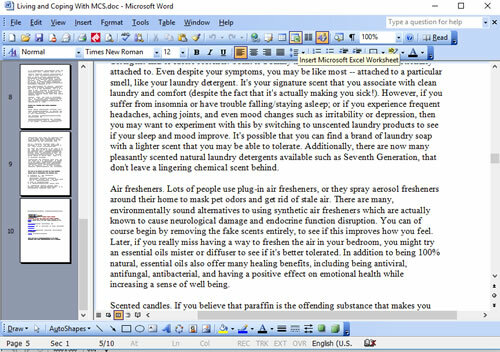 I just finished writing six articles on Multiple Chemical Sensitivity. I'm excited for the possibilities of how you can profit by publishing them. People who suffer from chemical sensitivities are definitely on the hunt for books, supplements, remedies and products to help them find relief from their chronic condition and all the unpleasant symptoms associated with it. 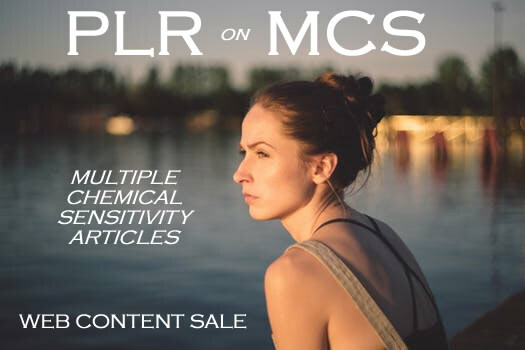 What's included in this pack of PLR articles on Multiple Chemical Sensitivity or MCS? What can you do with this content? Set it up to publish a series of six newsletters that speak to the health and wellness or environmental crowd! How much for this excellent quality Health and Wellness PLR on chemical sensitivity? To order, click the button below!